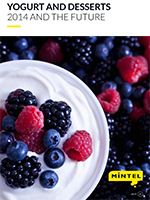 This global annual market overview will provide you with an in-depth review of the key issues in the global yogurt and desserts market through 2014 as well as our forecast for what will happen in 2015 and beyond. The US remains the largest yogurt and desserts market in the world. Value sales growth in the yogurt and yogurt drinks category have been strong. The introduction of Greek-style products led to strong year-over-year growth in 2011 and subsequent years. While the pace of growth is expected to slow as the new product novelty fades, continued product positioning that falls in line with consumer interest in both health and indulgence will allow for continued positive performance. In China, the overall yogurt market has more than doubled in volume sales. The category benefits from consumers’ appreciation of healthy eating as well as their growing disposable income. Value sales have been increasing at an even faster pace, fuelled mainly by consumers trading up to premium yogurt featuring advanced health benefits, higher nutritional values and more indulgent tastes. Looking ahead, there is scope for the yogurt market to further expand in volume consumption as the category is still far from reaching saturation.